I began the little tradition of tea time when I was nineteen years old. I had moved to Mississippi to begin my life as an aspiring homemaker. I lived in a historic 1900's Victorian Colonial one block from the beach. The home that had been turned into small apartments and a studio. The studio I lived in was the servants quarters at one time. The kind lady that was my landlady was from Denmark. I was immediately drawn to her as I have the Dutch heritage as well. Every day at 3:00 p.m. she would invite me over for tea and crumpets. It was the beginning of a lovely sentiment that I have carried with me henceforth. Taking tea can be anywhere. I am often found in the garden taking time for tea, while painting and spending time with my bunny, Oliver. Taking tea makes life beautiful no matter the circumstances. Meaning that everyone can make time for tea. It matters not of wealth, poverty, class, or status. Living in the most humble of homes is often times the loveliest to share in tea time. Usually, on Sundays, I will make a cookie of my liking to have for the week with my tea time. Two of my favorites that I've been making for decades are my Magical Mermaid Peanut Butter cookies and my Pirate's Pecan and Cranberry Biscotti. I am mostly a loner when I take time for tea, but I much prefer it. However, on occasion, I go to a little place called Whistle Stop Garden and Tea Room that's a few miles from my home. The lady that works there is from Cotswold, England and she serves tea, scones, jellies, treats and fresh English finger foods she makes herself. I thoroughly enjoy spending time with her, we talk mostly about gardening. 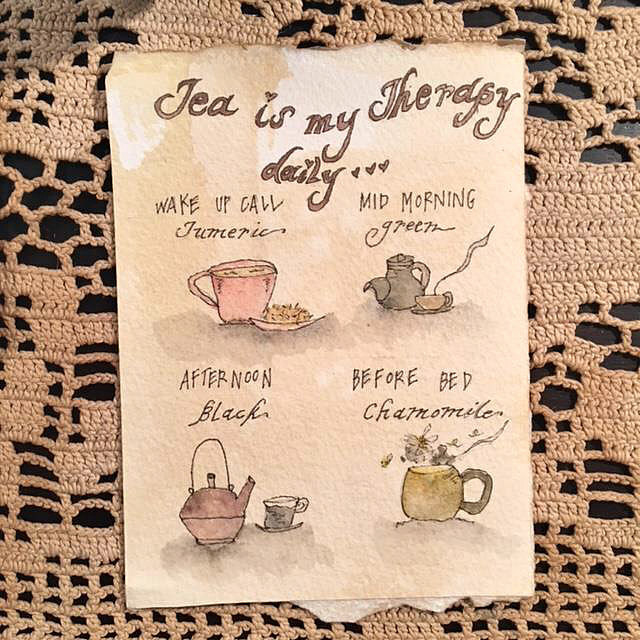 I actually schedule my tea time according to my little painting below. 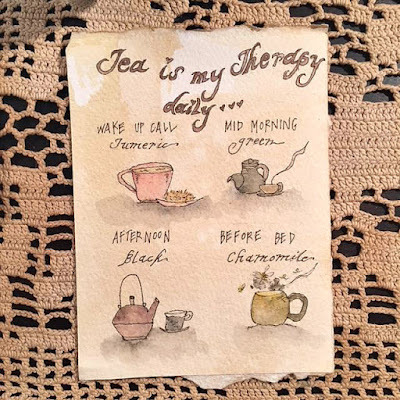 Here are a few tea remedies. Chai Tea is wonderful for a boost to the immune system, especially for the flue and colds. Lemon and honey tea is gentle and relieves a sore throat. Ginger tea settles an upset tummy. It's also fin'tastic for nausea. Peppermint tea is wonderful for digestion and bloating. Having tea in "My Treasure Room" is a daily ritual. I set time aside to spend quiet time with myself and of course my bunny Oliver. I spend the tea time making lists, planning little projects, reading my selected literature for the week, or looking through magazines to encourage my creativity. I always have a candle going during tea time. The ambiance is perfect. I have always made the spot where I take tea special. I use pretty cups, spoons, teapots, flowers fresh from the garden, and embroidered linens that I've collected. There's always some nice little inexpensive cups and linens at the thrift stores for pennies. The dollar tree has charming little candles too for that perfect romantic lighting. I have found that having tea time really energizes me and encourages my daily tasks for the day to be completed. My children growing up always knew that they were more than welcome to join me during tea time, and if they chose not to join me, they weren't allowed to interrupt my tea time. I made a very strict decision to take that time for myself. I truly believe with all of my heart that because I chose to be selfish with my desires, It taught my children to have respect for me, as well as, themselves. We are all individually important and self care is essential to our life's vitality. Here I am creating a list of inspired blog posts to write for my blog. A few paintings for your enjoyment.